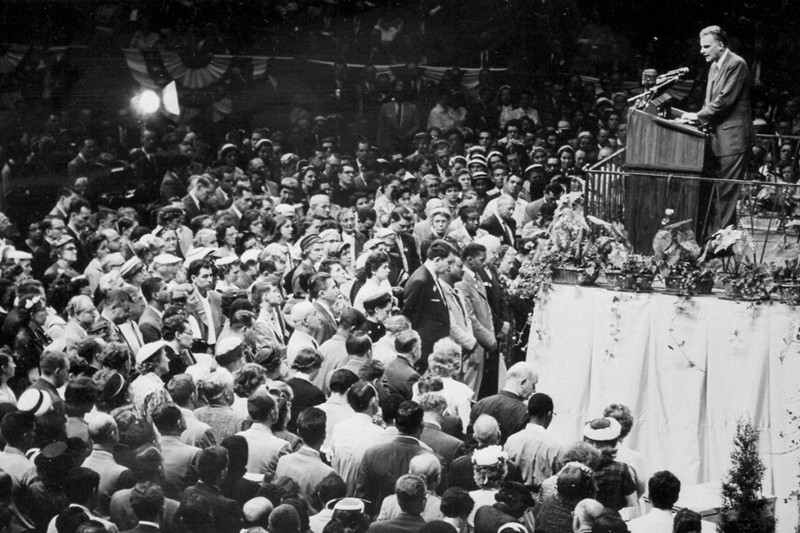 Billy Graham Trivia: Who Prayed with New Believers at a 1949 Event When the Crowds Were Too Large to Handle? Billy Graham’s ministry took off in the 1950s as he preached across the U.S., including the northeastern cities of Boston and New York. This 1957 photo was taken during his New York City Crusade that year. Q: Who prayed with new believers in Boston when the crowds were too large to handle? A: Billy Graham and his team, along with some spur-of-the-moment volunteers. On New Year’s Eve 1949, Billy Graham and his team held their first major evangelistic gathering in Boston. Media reports expressed skepticism over whether people would be interested in spending New Year’s Eve at a revival service instead of a party. When the service was packed to capacity, it sparked a two-week-long surge that drew more than 100,000 people to various venues across Boston, as Mr. Graham preached the Gospel of Jesus Christ. The response to the nightly invitations to accept Christ was often overwhelming. In those early days before the Billy Graham Evangelistic Association (BGEA) was formed, there sometimes wasn’t much advanced training for the volunteers who would come down to the front to pray with new believers. And sometimes there weren’t enough volunteers to respond to the crowds of people who came forward. That was the case in Boston. “Hence, all of us on the team—including Grady, Cliff, Bev, and myself—met with individual inquirers, helped by volunteers who stepped forward on the spur of the moment,” Mr. Graham wrote in his autobiography, Just As I Am. The BGEA was founded a short time later, and Mr. Graham’s team gradually developed a strategy for making sure each new believer received on-the-spot prayer and counseling, as well as the opportunity for long-term discipleship and Christian community through a local church. To this day, the BGEA holds Christian Life and Witness (CLWC) courses in cities where Franklin Graham, Will Graham or another evangelist has been invited to preach the Gospel. Local Christians who want to be part of the Crusade event can take the courses, which teach them about how to share their faith with others and how to guide new followers of Christ. There are also resources available online that can help Christians share the hope of Christ with others.